An otherwise healthy 37-day-old male presented to dermatology with a pedunculated, friable red glabellar mass (centered between the eyes). 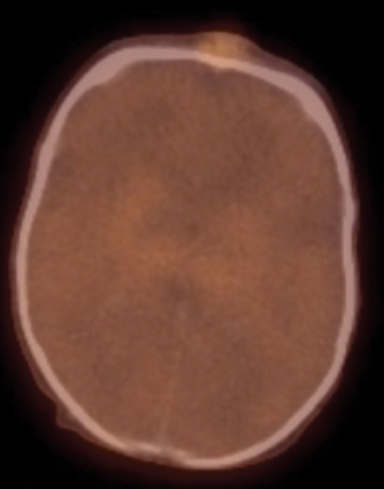 First noticed as a flat, bluish lesion at infant’s 10 days of age, its subsequent rapid growth led to an emergency department visit, where dermatology diagnosed a hemangioma and initiated propranolol treatment. Despite treatment, the mass continued to grow rapidly, encroaching upon the patient’s right eye. The patient was admitted for further workup. An elevated beta hCG, anemia (7.4 mg/dL), and thrombocytopenia (92,000) suggested an alternative diagnosis. MRI and ultrasound examinations led to a percutaneous biopsy; pathology was consistent with choriocarcinoma. 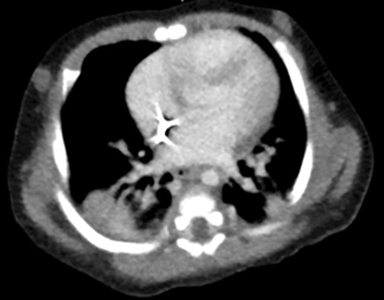 PET/CT found FDG-avid glabellar, liver and lung lesions. Maternal and placental testing was negative for choriocarcinoma. Choricarcinoma is treated as a germ cell tumor. Therapy was initiated as per Children’s Oncology Group protocol AGCT 01P1 (6 cycles of cisplatin, etoposide, and bleomycin). During cycle 1 he deteriorated requiring respiratory support and transfusions in the ICU. After cycle 4 he received a right lobectomy for the lung lesion and after cycle 5 the glabellar lesion was finally removed. 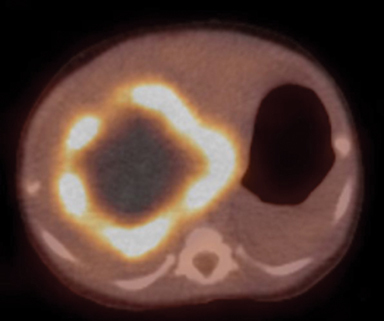 PET scan after 6 cycles did not show any FDG activity in the glabellar lesion or the lungs, but mild persistent activity in the liver. It was determined that liver transplant would be his best option, due to the location of the mass. 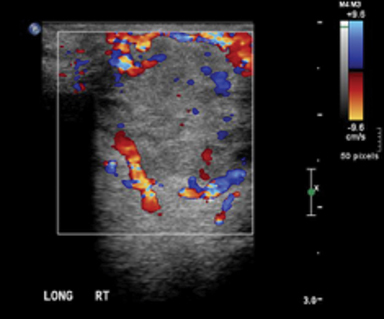 Ultrasound demonstrated a hypoechoic, hypervascular mass (Figure 1). 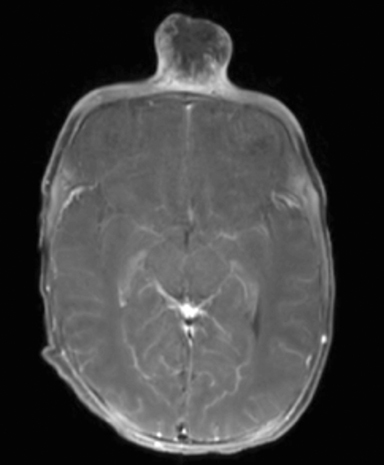 MRI brain scan demonstrated a cutaneous solid, avidly enhancing glabellar mass (Figure 2). 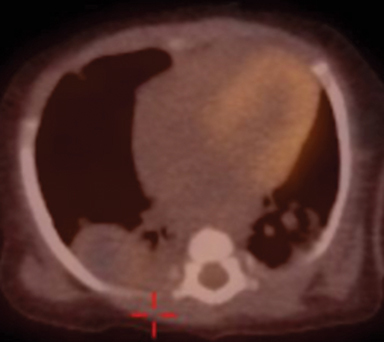 CT scan showed a peripherally enhancing liver mass and a mass-like area of consolidation in the right lung (Figure 3). 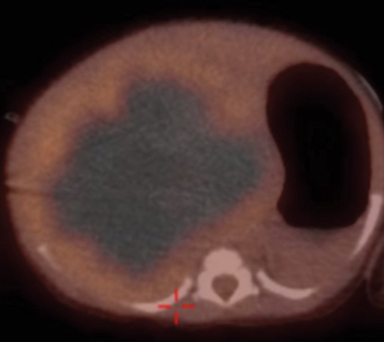 Initial PET/CT demonstrated FDG avid liver and lung metastases with a small focus of residual activity at the glabella consistent with incomplete resection (Figure 4). 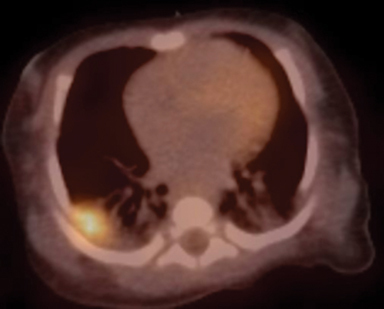 Follow-up PET/CT showed rapid re-growth of the glabellar mass and enlargement of the hepatic and pulmonary masses just 12 days later (Figure 5). 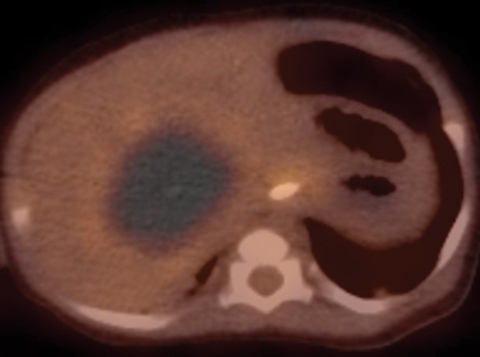 Three-month follow-up PET/CT showed significantly decreased size and activity of the metastases consistent with a treatment response (Figure 6). 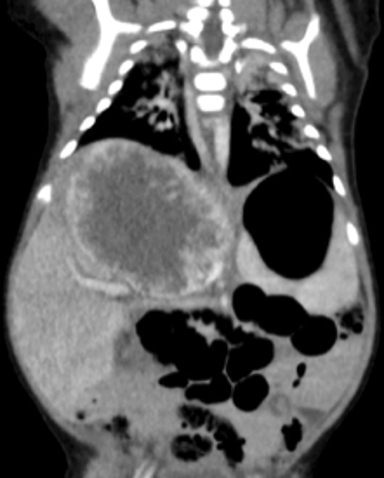 Infantile choriocarcinoma with cutaneous, liver, and lung metastases. The unusual predilection of infantile malignancies for cutaneous metastases allows their early discovery and creates vivid clinical stigmata. While relatively common in infancy, such presentations are exceedingly rare in children and adults. The location of the cutaneous metastasis in our case hastened the diagnosis and life-saving treatment. 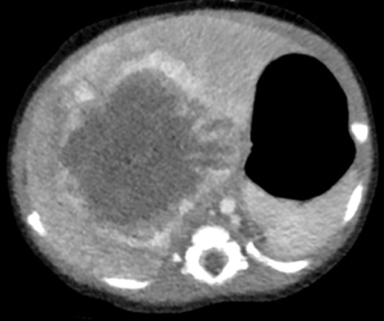 Choriocarcinoma is notorious for its life-threating hemorrhagic metastases and famous for being the first solid tumor to be cured with chemotherapy alone (methotrexate, 1956).2 It arises from malignant placental B-hCG secreting trophoblastic cells and typically occurs in the setting of a molar pregnancy. Maternal metastases are rarely seen in normal pregnancy (about 1 in 50,000 live births).3 Infantile metastases are extremely rare and may occur with or without maternal metastases. 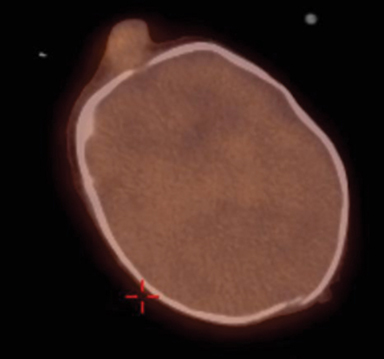 A solitary cutaneous metastasis can be mistaken for infantile hemangioma both clinically and radiographically. 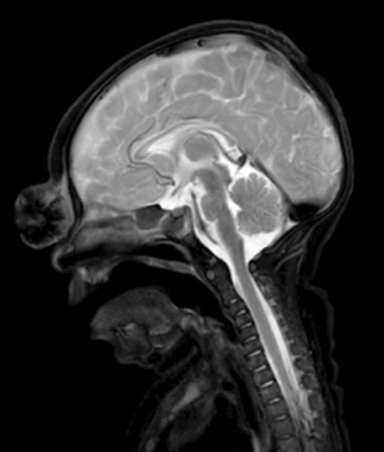 Atypical MRI appearance is one important clue that can suggest an alternative diagnosis. Early diagnosis and treatment of infantile choriocarcinoma is critical for survival. PET/CT may be useful for staging and follow-up. Isaacs H Jr. Cutaneous metastases in neonates: A review. Pediatr Dermatol. 2011; Mar-Apr;28(2):85-93. Yarris JP, Hunter AJ. Roy Hertz, MD (1909-2002): The cure of choriocarcinoma and its impact on the development of chemotherapy for cancer. Gynecol Oncol. 2003; May 89(2):193-198. Tidy JA, Rustin GJ, Newlands ES, et al. Presentation and management of choriocarcinoma after nonmolar pregnancy. Br J Obstet Gynaecol. 1995; Sep 102(9):715-719. Brooks T, Nolting L. Cutaneous Manifestation of Metastatic Infantile Choriocarcinoma. Case Rep Pediatr. 2014; 2014:104652. Epub 2014 Aug 12.
van der Hoef M1, Niggli FK, Willi UV, Huisman TA. 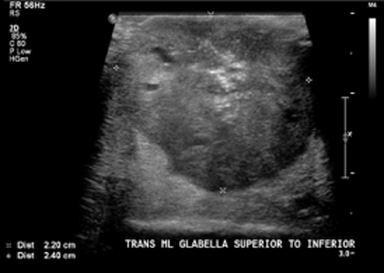 Solitary infantile choriocarcinoma of the liver: MRI findings. Pediatr Radiol. 2004 Oct;34(10):820-823. Epub 2004 Jul 28. Mapelli P, Mangili G, Picchio M, et al. Role of 18F-FDG PET in the management of gestational trophoblastic neoplasia. Eur J Nucl Med Mol Imaging. 2013; Apr;40(4):505-13. Yoon JM, Burns RC, Malogolowkin MH, Mascarenhas L. Treatment of infantile choriocarcinoma of the liver. Pediatr Blood Cancer. 2007 Jul;49(1):99-102. McNally OM, Tran M, Fortune D, Quinn MA. Successful treatment of mother and baby with metastatic choriocarcinoma. Int J Gynecol Cancer. 2002 Jul-Aug;12(4):394-398. Dance L, Patel A, Patel M, Towbin AJ, Towbin R. Infantile choriocarcinoma with cutaneous, liver, and lung metastases. Appl Radiol. 2018;47(10):32-35. 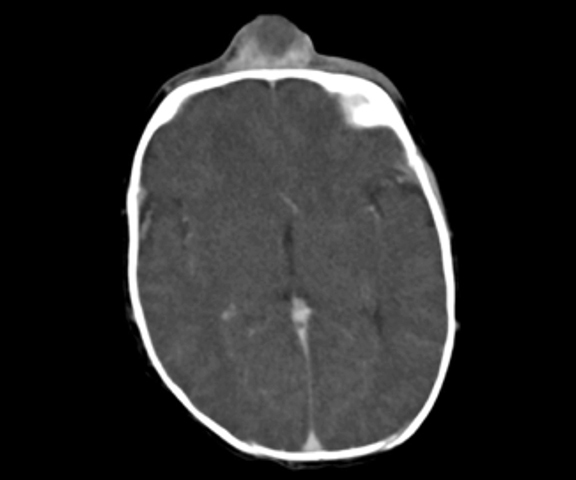 Prepared by Dr. Dance, Dr. Mittun Patel, and Dr. Richard Towbin while practicing in the Department of Radiology at Phoenix Children’s Hospital, Phoenix, AZ; Dr. Apurvi Patel while practicing in the Department of Hematology/Oncology at Phoenix Children’s Hospital, Phoenix, AZ; and Dr. Alexander Towbin while practicing in the Department of Radiology at Cincinnati Children’s Hospital, Cincinnati, OH.